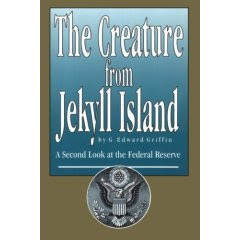 Since the banking system is in turmoil, I was reminded of a book that Loral pointed out to me: The Creature from Jekyll Island: A Second Look at the Federal Reserve. I found a Google video from the author about the book here and here is a summary with videos. Jekyll Island is an island off the coast of Georgia where all the multi-millionaires used to hang out. It is where the Federal Reserve System was created by J. P. Morgan, William Rockefeller and their associates. Interesting read. Just finished reading “The Creature”… great book. Very real. I have a Finance Degree from U.Miami and it’s true, the Universities of America teach their young financiers that the creation of the Federal Reserve system was done for the betterment of the masses. Only one thing they don’t stress too much in class: when the people running the system are undisciplined, short term thinking, populist reactionaries… the whole friggin’ thing will collapse. Who are those people: most politicians.